Imagine if you could decrease injury risk in your child AND maximize coordination and performance at the same time. What if I told you the solution would be simple, not cost much financially and would allow you to have some fun exercise time with your kids. Would you do it? You may or may not have heard of the W sitting position in children. Many parents and teachers have heard of the W sit and work to correct it. But do you know why the W sit is bad and what consequences it can have on the development of a child? Do you know how and why correcting it can reduce injury risk and maximize performance? 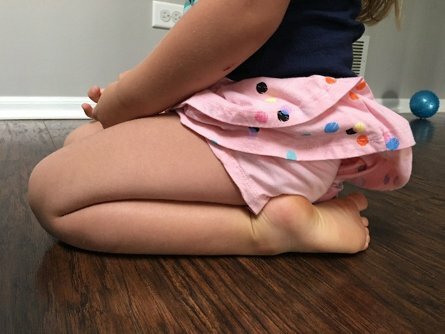 W sitting is when young children sit on their bottom with their knees bent in front of their body and their feet out to the sides of their hips. If you were looking over the top of the child their legs would appear to be in a “W” shape position, as seen in the picture below. From a biomechanical perspective, the femurs (the upper bone of the leg) are internally rotated excessively in the hip joint. This can be a normal part of development in young children under 4 if performed occasionally for short periods of time. The trouble is that children who W sit tend to sit like this and play for extended periods of time or sit like this every time they sit on the ground. How you ever heard the saying “use it or lose it?” Well, in kids, it is quite the opposite. If kids do something too much, like W sit, their developing bodies and joints can then become like that for the rest of their lives. Excessive W sitting as a child can lead to a structural issue known as femoral anteversion, or excessive internal rotation of the femurs at the hip joint (sound familiar from the description of the W sit). Once the shape of a child’s joints are fully developed, typically around 13, the structure is there to stay and all you can do it this point is help make that joint as efficient as it can be despite its disadvantage. Now you might be saying, this doesn’t sound that bad, my kid will be super flexible like Gumby or Stretch Armstrong. While that may be true, femoral anteversion can have long-term or even disastrous consequences. With femoral anteversion, it is very common for certain muscles, especially the gluteals, to have less leverage and have more difficulty performing their job to help stabilize the hip and leg. This difficulty becomes very apparent at the knees as this joint often likes to move inwards (medially) during walking, running, cutting, jumping and many other activities. If you combine this inward motion of the knee with increased flexibility (especially in ligaments) or a bad position, cut or landing, you have a significantly higher risk for a non-contact knee injury such as an ACL or meniscal tear. Even if your child does avoid a disastrous injury, many adults with femoral anteversion often end up with foot and knee problems, among others. It is also my opinion that femoral anteversion decreases performance, often significantly, for individuals playing certain sports. Sports such as soccer, football, and basketball (among others) require dynamic hip coordination, power, and speed. Children and adults with femoral anteversion may be less coordinated on the side(s) of anteversion and have less power and speed as well due to having less muscular leverage, as previously discussed. If you see your child W sitting, options to correct it include sitting cross-legged (criss-cross applesauce) or having them sit with their feet directly under their bottom. If you still notice your child consistently W sitting once they are 6 or older, please consider consulting a professional that is trained in pediatric development. If you notice your child hitting their knees or their knees caving inward when they walk, run or jump, please again consider consulting a professional. Or, if you just notice that your child is uncoordinated, and you aren’t sure why once again please consider seeing a professional. There are many options and exercises to help shape your child’s body development, if needed, in a positive way. Many people often have their child evaluated regularly by a Pediatrician but not necessarily by a pediatric development and movement specialist. I would highly suggest you consider having your child or children evaluated at least once a year to be sure developmental is normal and to head off any issues. Ben Franklin is famous for saying, “an ounce of prevention is worth a pound of cure.” This is especially true when it comes to kids.